Guide to FTSE 100 / DAX 30 differential spread betting. Where Can I Trade on Differential Spread Betting Markets? Where Can I find Differential Spread Betting Charts? Where Can I Spread Bet on Differential Markets? Differential markets simply compare the price difference of two markets. Considering an example, if the FTSE 100 is priced at 5925 and the DAX 30 is at 7025 then the difference between them is 1100. As a result, a spread betting firm like Financial Spreads might offer a FTSE 100 - DAX 30 differential market of 1098.0 - 1102.0. This would mean that Financial Spreads’ account holders could spread bet on the differential to rise higher than 1102.0 or fall lower than 1098.0. Thinking of this another way, this differential market is a way of trading the relative strength of the FTSE 100 index versus the DAX 30 index. If you think that the FTSE 100 index will perform better than the DAX 30 index you could decide to spread bet on the differential market to decrease. Likewise if you think the DAX 30 will perform better then you can speculate on the differential to increase. If you made two opposing trades the effective spread would be wider. A single differential trade offers spread betting account holders tighter spreads. Please note that differential futures markets are either quarterly or monthly and so they have a closing date. The example considered above uses a ‘June’ market and, therefore, if you haven’t already closed your spread bet before the appropriate closing date, any open positions will be settled in June. Please see the spread betting example below for more information. You can get differential spread betting charts with spread betting companies such as Financial Spreads. As with all charts from Financial Spreads, you are able to alter the chart settings to view the data over a variety of different timescales such as ticks, minutes, hours, days and so on. They have also provided a variety of technical analysis options to help your research of the financial markets. As with a lot of financial markets, you are able to spread bet on differentials, such as the "FTSE 100 - DAX 30 differential", to either rise or fall. At the time of writing the DAX 30 is priced at 7025 and the FTSE 100 is at 5925. On the closing date for this 'June' market, 17-Jun-11. Whilst placing a spread bet on the FTSE 100 - DAX 30 differential you trade in £x per point. So, if you decide to invest £6 per point and the FTSE 100 - DAX 30 differential moves 4.0 points then that would alter your bottom line by £24. £6 per point x 4.0 points = £24. Then you might buy a spread bet at 1102.0 for a stake of, for example, £3 per point. So, with such a trade, you would make a return of £3 for every point that the FTSE 100 - DAX 30 differential moves higher than 1102.0. Nevertheless, such a bet also means that you will lose £3 for every point that the FTSE 100 - DAX 30 market goes lower than 1102.0. Put another way, should you ‘Buy’ a spread bet then your profit/loss is calculated by taking the difference between the closing price of the market and the price you bought the spread at. You then multiply that difference in price by the stake. Trading differentials, whether by financial spread betting or otherwise, can go against you. In this case, you wanted the market to rise. Of course, the differential can also decrease. If the FTSE 100 outperformed the DAX 30 and the FTSE 100 - DAX 30 differential fell, settling at 1063.4, then this means you would end up making a loss and losing money on this trade. Note: FTSE 100 - DAX 30 June Differential market accurate as of 30-Mar-11. Spread Betting as well as commission free CFD Trading on 2,500+ markets, 24 hour trading, professional level charts and..." read Financial Spreads review. 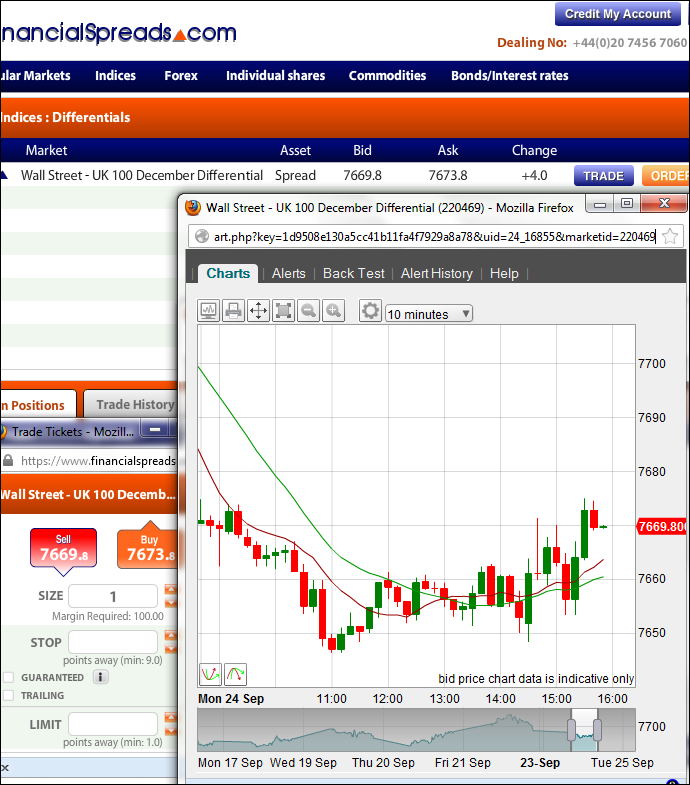 The daily afternoon trading update on the main stock index, forex and commodities markets as the UK markets close. Insight comes from analysts at one of the leading companies in... » read analysis. The morning market video takes a quick look at what's happening in the stock markets today. It covers the big trading news, price updates and major market moving events as well as... » read analysis. With analysis straight from the trading floor, the daily morning market update has views and opinions on the popular forex, commodities and equities spread betting markets including... » read analysis. 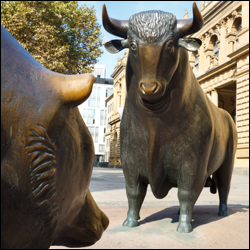 A daily market review of the key European and US markets as well as a quick look at the forex and commodities markets. In the last trading session we saw... » read analysis. A guide to the Commitments of Traders reports with weekly updates on the futures markets, understanding the signals, how to read the COT report and... » read guide. A recap of the main stock indices, FX and commodity markets as the London markets closed during the last trading session. We also have analysis and views on the latest... » read report. A recap of the major equity, FX and commodities markets as London was opening for the last trading day. We also have the latest market updates on... » read report. Quote of the day plus the last 5 political, funny, topical and/or interesting quotes. We also have some classic political errors on video and... » read article. A guide to spread betting on the FTSE/DAX differential including where to spread bet on differentials, how to trade the FTSE 100/DAX 30 market, getting live charts and prices, worked trading examples and... » read from top.